Collected bits and bobs perched around my Shanghai apartment are what makes my white walled space a home. Forever evolving as I find use for or prettiness in found objects, or inherit treasures from friends’ homes as the revolving doors of this city continue to spin, it’s these little trinkets that add a touch of magic and sparkle to where I live. 1. I rescued wooden Bench from a demolition site in downtown Shanghai whilst on a mission to find an old door with which to create a table. Both the door and the bench set us back a mere 10 yuan. 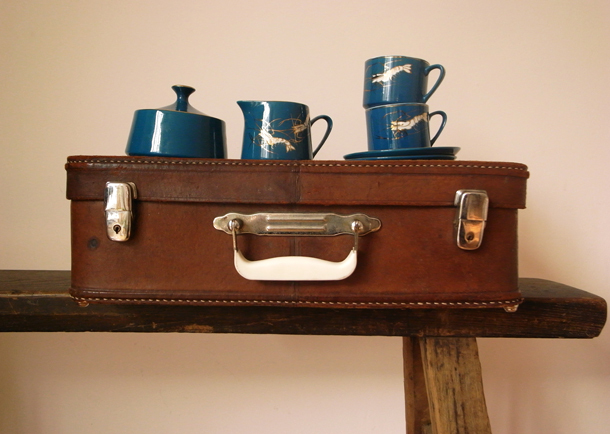 Vintage Leather Suitcase (80 yuan) and Blue Prawn Tea Set (180 yuan) were gleaned from a huge warehouse stocking piles and piles of furniture and knick knacks in the distant land of Pudong, Shanghai. Leather suitcase is terribly handy as a compact camera equipment bag for onsite shoots. Made in China retro tea set, came as a set of five cups and saucers, milk jug and sugar bowl. 2. 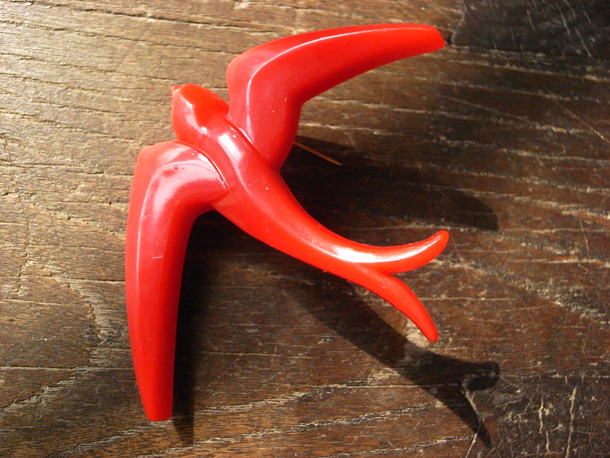 Bird Brooch from St Vincent de Paul charity shop in Wagga Wagga, Australia. A cheap and cheerful 5 dollars. 3. 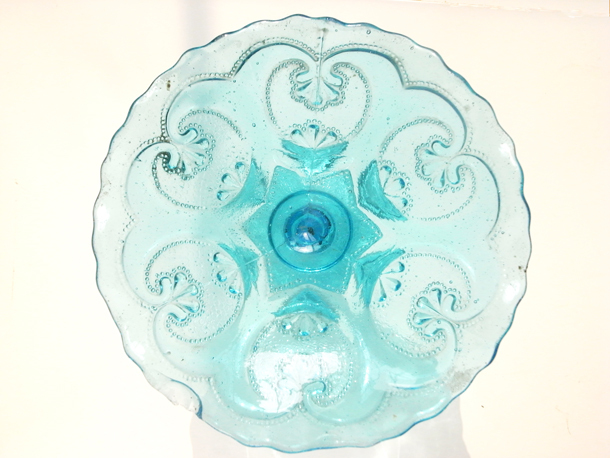 Old Glass Lolly Plate from antique shop on Yongjia Road, Shanghai. 4. 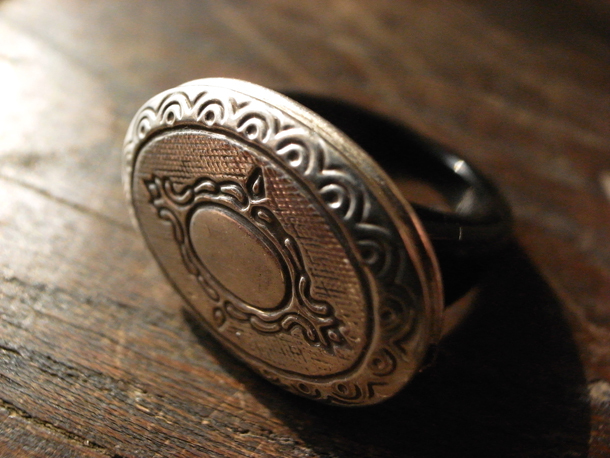 Handmade Locket Ring from street stall in Insadong, Seoul. It cleverly refashions a silver necklace locket onto a black plastic band. 20,000 won. 5. 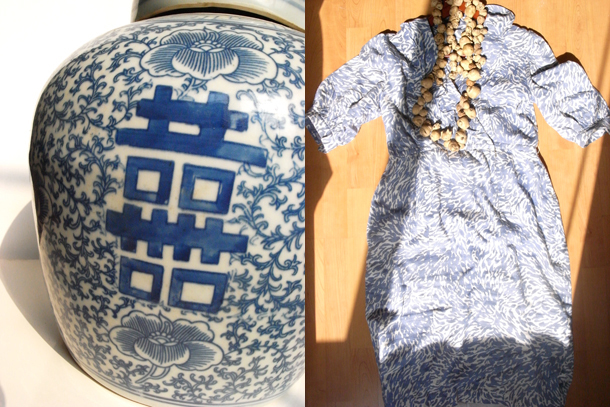 This Patterned Dress was snapped up at a 10 yuan courtyard house moving sale in Beijing. It was most likely purchased from the clothing market at Beijing Zoo selling vintage apparel by the tonne from Korea and Japan. Also rescued from departing friends are these special Seed Beads, originally from Yunnan, previously left with her by a mutual friend dashing off to India. They’ll probably return the full circle back to him later this year when he passes through Shanghai. 6. Perfect for hiding treasures, the Double Happiness Pot was also found at the Pudong warehouse. 7. 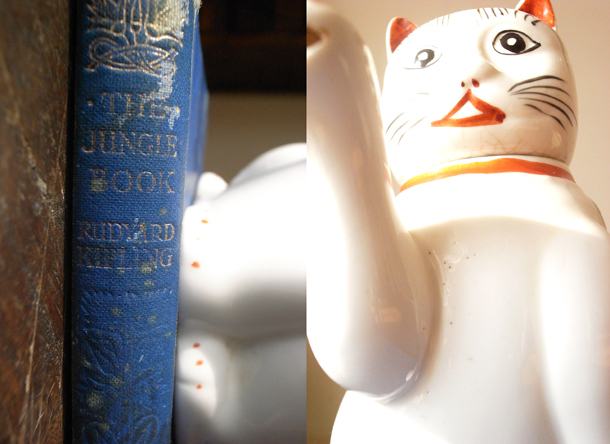 The Jungle Book was a precious gift from second hand bookstore in New Zealand from my dearest colleague and friend as we researched the story for an event we were creating. Keeping company with animals of the jungle is Cat Teapot, nicknamed Little Tam; an excitingly spot in Dongtai Road Antique Market for approx. 200 yuan. 8. 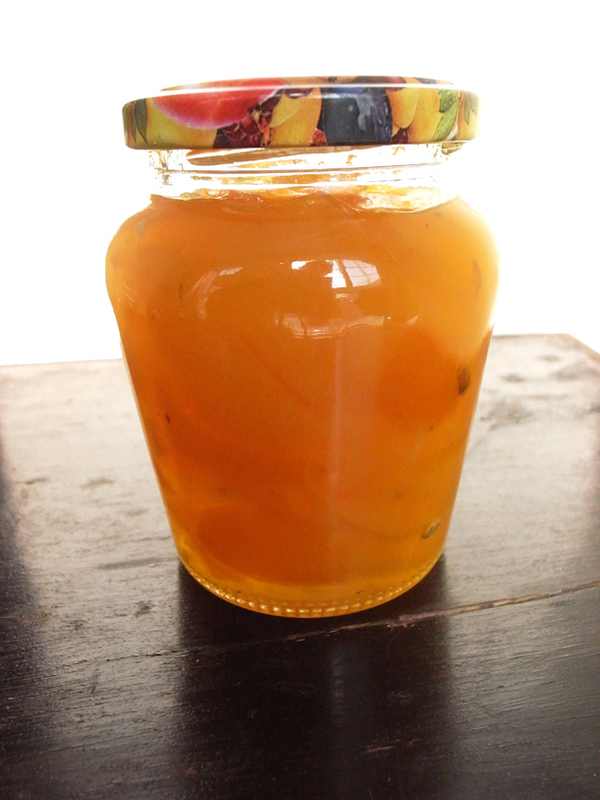 Homemade Cumquat Jam. Now in Shanghai, originally from Melbourne via Beijing, this was retrieved from the refrigerator of departing friends. This entry was posted in Covet, Shanghai and tagged covet, design, home, lauren. Lauren (Shanghai) is a country-girl from Australia, who studied in Asia, Europe and Australia before venturing back to China. Now a Shanghai resident for 5 years, she is a project manager that thrives on offbeat briefs and clients with a sense of humour. A lover of art, food and walking, she blogs about her adventures in food at Tastebites.net. Beautiful photos Lauren, Kudos! I especially want the kumquat jam. Do you have a recipe? Thanks Natasia. I’m on a mission to find this recipe. Will post it back soon! beautiful Lolly Plate from a cool perspective! Nice pictures! I really like your blue prawn tea set. Such character! You have a stylish eye for composition, well done. Do you have a Pinterest account by any chance? Still working on that Cat, I’ll keep you posted! Wow I’m a little in love with your copy of the Jungle Book. I have a copy that was completely ruined that I now use as a Kindle Cover, but it’s just not quite the same. Beautiful pictures!